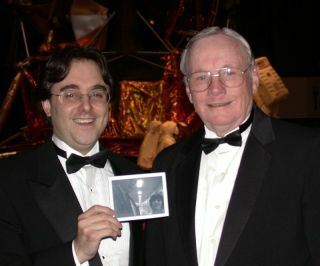 Space writer Andrew Chaikin poses for a photo with Neil Armstrong, the first person to walk on the moon, during a 2002 Apollo anniversary event at the Smithsonian National Air & Space Museum. Chaikin is holding photo of the duo taken by Armstrong in September 1971, at NASA HQ, using Chaikin's father's Minox camera. As the nation bid farewell to Neil Armstrong earlier this month, my wife and I sat in the stone-and-stained-glass grandeur of the National Cathedral listening to appreciations of history’s first moonwalker. For me it was the end of a journey that had begun more than four decades earlier, even before Armstrong took his “one small step” onto the Sea of Tranquillity, during the summer I turned 13. Watching him on TV at the Apollo 11 pre-flight press conference in 1969 I sensed something special about him, a thoughtful, articulate nature that seemed to set him apart even from other astronauts. He quickly became for me a hero among heroes, a kind of superman. And yet, I heard him say before and after Apollo 11 that he was not unique, not deserving of special praise, a message I managed to absorb even as I idolized him. I’d already been lucky enough to meet several Apollo astronauts, but now, as a full-fledged Apollo fanatic, meeting Neil Armstrong became one of my fondest hopes—not quite an obsession, but close. Making my way down the long corridor to Armstrong’s office, barely containing my excitement, I reached my goal only to be told by his secretary that he wouldn’t be in that day. Dejected, I headed back toward the elevators. But then, as I looked up, my gloom vanished: there was Armstrong, carrying his briefcase, walking toward me. I told him, "I'm about as interested in space as you can get." Minutes later, I had the autograph I had longed for, but there was one more thing I had to have: A photo. I had brought along my dad’s little Minox camera, but there was no one else in the hallway where we stood. Armstrong offered to take the picture himself, holding the Minox with one outstretched hand and pointing it back at us. And then, before we parted, I tried to communicate to him that I understood he was not a superman but a flesh-and-blood human being. Armstrong didn’t say anything in response. Looking back, I'm pretty sure he didn't know what to make of this 15-year-old who looked much younger, with a mop of hair, saying such things. But I was on a nirvana cloud. I had met my ultimate hero. Seventeen years later, in October 1988, I was once again face-to-face with Armstrong in Washington, this time to interview him for my book "A Man on the Moon." By now I knew only too well his reputation for reticence and his reluctance to grant interviews, but I had managed to win his cooperation. Still, I wasn’t sure what to expect from this encounter. Armstrong had warned me on the phone a couple of weeks earlier not to expect him to answer personal questions; he would only talk about "matters of fact." I shouldn’t have been surprised: Neil Armstrong was the essence of the engineering test pilot. And when I asked about the enormous role in which fate had placed him as the first human being to walk on another world, his answer revealed a man who saw himself in the broad sweep of human achievement. "I don't focus on self-satisfaction and being first," Armstrong told me. What mattered to him, he said, were the contributions he’d helped make to Apollo and the other programs he’d worked on, things that helped get humanity "to a new plateau to look from. That’s just the way I tend to look at things." Interviewing Neil Armstrong was one of the highpoints of my professional career. In the years that followed, I got an even greater gift, as he and I became friends. Anytime I saw him, whether at an Apollo anniversary event, in the SPACE.com boardroom, or even in a more private, social setting, I delighted in his warmth and humor. I valued his feedback on my work. And I cherished knowing a man who in every way lived up to the role in which fate placed him. Neil Armstrong went to the moon with the supreme self-confidence and skill necessary to carry out history’s ultimate test flight. When he returned, despite his innate shyness, he showed the strength of character to carry out the mission we gave him, one for which there could have been no adequate preparation: to be a world icon. Now that he is gone, I feel how blessed I am to have known him, and how lucky we all were to have experienced this singular human being, ideally suited for a singular place in history. Space journalist Andrew Chaikin is an Apollo historian and author of "Man on the Moon," "A Passion for Mars" and co-author (with Victoria Kohl) of "Voices From the Moon" and the children's book "Mission Control, This is Apollo." You can find him at: www.andrewchaikin.com.